With data-driven governance it is possible to have all information needed to make important decisions. I have your dashboard open. Can you explain the reasons of the rejection chart to me?” Minister of State for Petroleum and Natural Gas, Dharmendra Pradhan was curious. He was referring to a real-time dashboard that pulled and compiled data from each of the country’s 18,000 LPG distribution centres every day to drive faster and better execution of the Pradhan Mantri Ujjwala Yojana, launched to provide LPG subsidies to women living below the poverty line. The dashboard compiled key metrics — how many new applications oil marketing companies had received under the scheme, how many had been accepted or rejected and how many women had finally been given LPG connections. This allowed the scheme administrators to dive deeper to identify where processes were getting stalled and needed to be fixed. The solution was ridiculously simple. Today, the number of women getting rejected due to lack of bank accounts is down to almost nil. This is data-driven governance at its core — having the information you need to make important decisions at your fingertips. Around the world, data science is remaking governance; hard data —rather than opinions, lobbying or influence — is driving policy decisions. 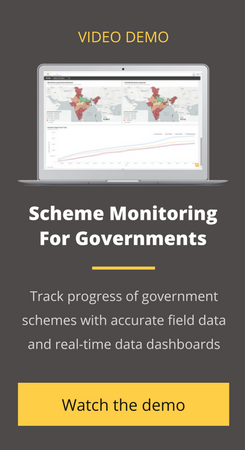 With all the data they need readily available — always — policymakers and other strategic decision makers can identify focus areas, increase transparency and track the actual outcomes of their initiatives. Be it designing a national health scheme, identifying the best locations for opening new stores, or investing in female empowerment initiatives, data can transform anything. In 2010, when New York City attempted to make data an intrinsic part of its strategy, it hired a chief analytics officer, Mike Flowers. His initiatives, driven by insights gleaned from the city’s large amount of untapped data, were a success and led to the creation of the Mayor’s Office of Data Analytics (MODA) that today unifies data across city agencies to tackle everything from crime to disaster response to strengthening anti-poverty initiatives. India is steadily following MODA’s lead as key administrators across ministries and governments increasingly champion data-driven initiatives. Though tentative, the move to make data-driven governance mainstream is certain. It may seem improbable but data has always been part of government decision-making. The celebrated Arthashastra, the Principles of Government, which prescribed that population statistics be collected for taxation, describes the methods to conduct demographic, economic and agricultural censuses. However, most government data today is based on small samples of population or is outdated — the Census of India happens only once in 10 years. In today’s world of real-time data, that just isn’t acceptable any more. The PM Ujjwala Yojana is arguably one of the largest and fastest executed programmes nationally. Within nine months of being announced, it received applications from 20 million women. The scheme involved drawing upon the machinery of the three oil marketing companies in 13 states, drilling down to 18,000 distribution centres for marketing, receiving and processing applications, and mobilising over 50,000 field mechanics to install connections in houses that need clean cooking fuel the most. So when the petroleum ministry wanted to promote universal LPG coverage, it saw value in using big data. Rather than struggle with incomplete and outdated existing databases, or guesstimates, it brought in data science to make sense of information across six levels of hierarchy — senior management from head offices > state officers > district nodal officers > distributors > field mechanics > citizens. This is how data intelligence helped tackle the problem. First, the ministry used 6.4 million data points about LPG penetration, income and population growth, which was transformed into a dashboard identifying locations with the greatest reach. The next stage was monitoring. Data on LPG applications was transformed into an interactive dashboard with the state, district, and village-level comparisons for applications received and rejected and connections installed. In one snapshot, the minister now had all the information he needed on the performance of every state. Armed with this, he was now able to check the dashboard on his tablet every morning, take stock and call officers, particularly those whose performance was marked “red”. During the launch phase, he conducted video conferences directly with the district nodal officers (DNO) — hour-long meetings to strictly discuss data. In one such meeting, DNOs from the remotest corners of Uttar Pradesh tuned in. The minister called out every district by name and asked the officer to provide a quick update, which he then cross-checked with key parameters on his tablet. One officer was praised for his efficiency — the district had cleared the maximum number of connections. Then, another DNO, who claimed that he faced no challenges in execution, was reprimanded — he had processed so few applications! As 500-plus representatives in Parliament decide on matters of governance and development for 1.2 billion people, it is easy to see how these decisions must be taken in silos, with little real-time assessment of the ground reality. However, that is changing with that ubiquitous tool — the Android phone. Leaders can now tune into the voices of millions in real time. Big data is at hand to aid decision-making. So when the minister is questioning the data, he is in effect giving voice to the silent majority and closing the vast gap between the corridors of Shastri Bhavan and the remote villages of Baliya. Data is more than just numbers. The article was originally published in Business Standard and has been reprinted here with permission.